Antarctica: Researchers Reveal ‘Giant Wetlands’ 800 Metres Beneath Ice – Coercion Code – "Dark Times are upon us"
Researchers have revealed what really lies under western Antarctica. They say the subglacial Lake Whillans, which lies 800 meters (2,600 feet) beneath the West Antarctic Ice Sheet, is similar to a wetland. They hope by analysing the area, it could give new insight into how sea levels will rise and the ice melts due to global warming. Blog Editors Note: Or how the world was and looked some 5000 years ago, when the world had no polar caps at all; more helpful I think. 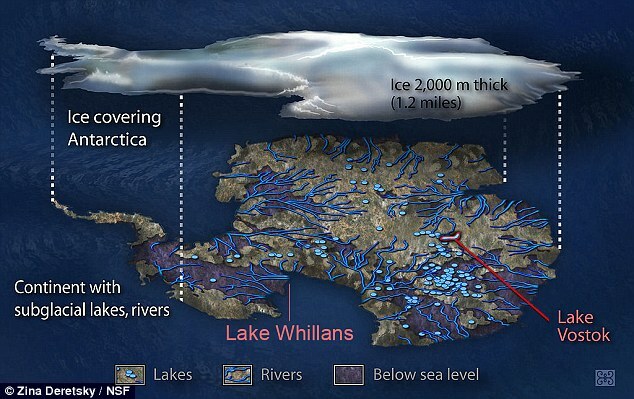 Lake Whillans, which lies 800 meters (2,600 feet) beneath the West Antarctic Ice Sheet, is similar to a wetland. The findings stem from the Whillans Ice Stream Subglacial Access Research Drilling (WISSARD) project funded by the National Science Foundation (NSF). “It is amazing to think that we did not know that this lake even existed until a decade ago.,’ said Helen Amanda Fricker of Scripps, who initially discovered Subglacial Lake Whillans in 2007 from satellite data.